We haven't had a thaw since sometime in December of 2002, we had at least three days in a row of well below -20 degree nights and up here in northern Vermont, we actually have less than a foot of snow on the ground. 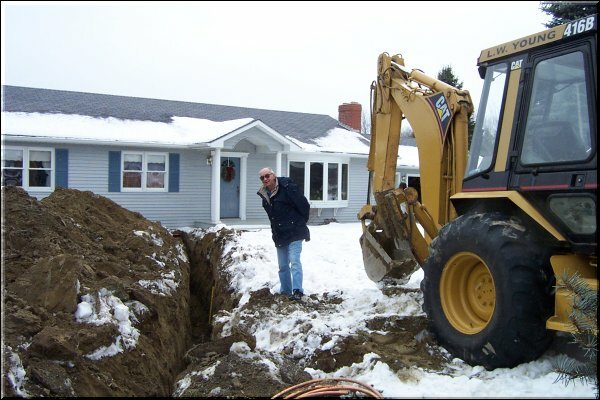 As shown above, frozen water lines are causing havoc and it is expected that as the frost, which is estimated by some individuals to be as deep as 4 1/2 feet, will be causing many problems. During the cold weather, many homes suffered from frozen water pipes within the house. The safest way, of course to unthaw them is with warm water, however, that is usually rather scarce at that time, so the second most used item appears to be a portable hair dryer. Unfortunately, a number of individuals used torches & open flames which ended up in a disaster, with several homes in the area being burned to the ground. For those of you that live South of us, you have been plagued with snow, which most likely will end up in flooding at a later date. Even though there was plenty of snow on the Mountain, even the ski resorts were complaining as it was even too cold to ski - unless you had made a reservation some time ago and decided you were going to make the best of it since you were committed. Anyhow, Town Meeting Day is not far off and for sure, that means Spring is here or at least close by. If your water lines haven't frozen, you haven't been snowed in, lost power for hours on end, don't have a lot of school snow make up days that might make you attend school on Saturdays or into late June, then things certainly could have been worse.